Are double-crested cormorants overrunning their niche—or recovering from centuries of suppression? 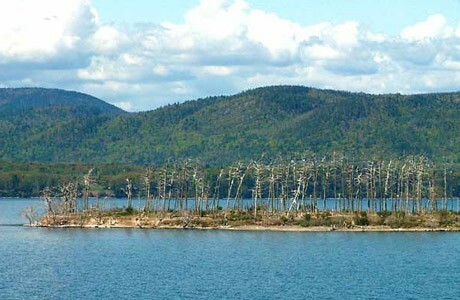 Dead trees on a Lake Champlain island testify to double-crested cormorants’ effect on vegetation. Like other waterbirds, they strip off foliage for nesting material, and plants are killed by the accumulation of guano, which is acidic. The cormorants moved onto the island in 1983, after managers chased them off a different, treeless island. So what does it mean for a species as cosmopolitan as the double-crested cormorant to be “overabundant”? How many cormorants are “too many”? Much of the debate about managing the bird swirls around whether it’s native to a particular region and how many once lived there—facts that have been difficult to pin down. 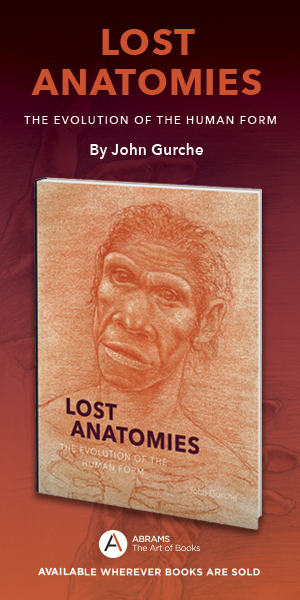 Wires and Francesca J. Cuthbert, an avian biologist also at the University of Minnesota, made a recent attempt, examining archaeological records and naturalists’ accounts, among other sources. Before Europeans became a major presence, Wires and Cuthbert conclude, double-crested cormorants lived throughout much of their current North American range, usually in populations far greater than today. For example, after birdwatching near Natchez, Mississippi, in December of 1820, John James Audubon reported: “We saw to day probably Millions of those . . . Cormorants, flying Southwest—they flew in Single Lines for several Hours extremely high.” Numbers like that simply don’t exist today. 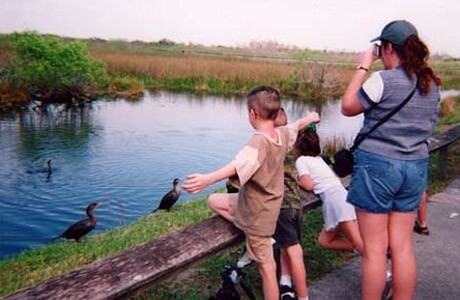 To be sure, it is often impossible to tell whether a specific area was historically home to the birds. Cormorants might well have nested on South Dumpling Island at the time of European contact: explorers’ accounts and archaeological records show nests within a hundred miles, and an 1847 nautical chart identifies a Cormorant Reef and a Cormorant Rock within five miles. Cormorant Cove lies twenty miles away. None of that proves they nested at South Dumpling—or at the other locations—but clearly cormorants are regional natives. As with most animal species, the population history of double-crested cormorants in North America has been shaped by human activity. 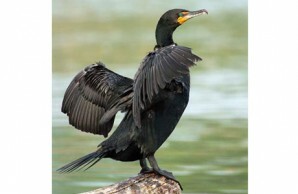 Native Americans on both coasts ate cormorants and their eggs. Early European settlers didn’t seem to eat much cormorant, but they did use the bird’s meat for fish bait. 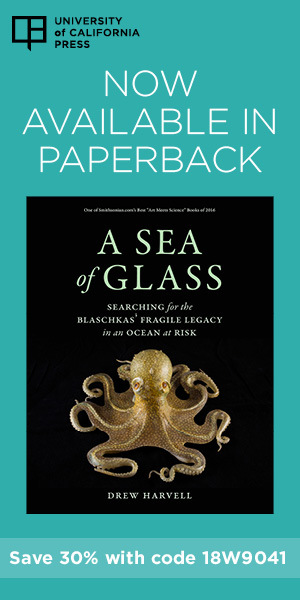 By the nineteenth century, most seabird populations in New England and Nova Scotia had plummeted. Settlement and industry had encroached on island nesting areas. People gathered eggs for food, and shot all kinds of seabirds for meat, hat feathers, sport, and to keep them from eating marketable fish. Men pegged cormorants, specifically, as fish stealers. Harrison Flint Lewis, author of the first North American doctoral thesis on cormorants, wrote in 1929: “The history of the Double-crested Cormorant during the latter part of the nineteenth century and the first quarter of the twentieth is largely a history of persecution and of the gradual abandonment of one breeding-place after another.” By that time, cormorants no longer bred anywhere in New England. [T]here had been light gunfire on the cliffs, where several men were shooting at black cormorants; and it developed that everyone in Cape San Lucas hates cormorants. They are the flies in a perfect ecological ointment. . . . They dive and catch fish, but also they drive the schools away from the pier out of easy reach of the baitmen. They are considered interlopers, radicals, subversive forces against the perfect and God-set balance on Cape San Lucas. And they are rightly slaughtered, as all radicals should be. Then came 1972, one of the few good years in recent cormorant history. The National Audubon Society listed the double-crested cormorant as a species of special concern. The state of Wisconsin declared cormorants endangered and began building nesting structures to help them return. Lawmakers banned the use of DDT, and Congress signed a revised Migratory Bird Treaty Act that put cormorants under federal protection. Cormorant populations have since rebounded, thanks in part to conservation measures and to people’s inadvertent creation of ideal cormorant habitat near ample food supplies. For example, at the mouth of the Columbia River, the Army Corps of Engineers enlarged and stabilized an island with dredge spoil in the early 1980s. Today East Sand Island in Washington State hosts the continent’s largest cormorant colony (albeit with fewer than 14,000 breeding pairs), surely because it is a protected, mammal-free nesting habitat near migrations of wild and farmed salmon and steelhead. The cormorants, along with Caspian terns, feed heavily on thirteen endangered salmonid stocks—a legitimate cause for concern, though it must be remembered that people both caused the salmon’s problems and built the cormorants’ base of operations. Now managers are trying to lure the terns to artificial islands being built for them on distant lakes, and may attempt the same for the cormorants. Meanwhile, catfish and baitfish aquaculture has been rapidly growing since the 1960s, particularly in the southeastern U.S., directly on the cormorants’ migration route. Open aquaculture ponds provide winter or year-round homes with food aplenty. Many of the same cormorants breed and summer up north in the Great Lakes. That’s the area with the greatest growth in cormorant populations, and the center of a good deal of the controversy. It’s also the area where Wires and Cuthbert’s evidence for cormorants’ former abundance is the most anecdotal and inconclusive. The population growth in the Great Lakes—from approximately 90 breeding pairs in 1970 to nearly 115,000 in 2000—was fueled, ironically enough, by government managers stocking the region’s waters for recreational angling, often using fish raised in the southeastern aquaculture ponds. Great Lakes cormorant numbers seem to be holding steady today; indeed, recent nest counts suggest that cormorant populations nationwide are beginning to plateau, even to decrease in a few areas. If so, they’ve likely stopped far short of achieving numbers that existed throughout much of North America before European settlement.